I got a chance to talk with Gary Johnson on the phone this evening before my service went kaput. He apologized, and acknowledged that he had had some bad advisors around him in 2014-2015 who filled his head with Frank Gaffney lunacy, and that he wanted me to text him on his personal number any time he stepped out of line. He also took notes on my platform of changing the conversation, and adopting the language used by people like Hamza Yusuf, Yasir Qadhi, Zaid Shakir, and Suhaib Webb when discussing groups like al qaeda and ISIS. He even asked me to coach him in the closest thing to a proper pronunciation of kharajite as he could muster….and assured me he would start using it in his public discussions of terrorism. He also acknowledged that his statements on Iran at the debate had been erroneous, and that he was only making those statements based off of those of Kerry, and had not done much research further. He agreed that Saudi, Qatar, and the US do far more to fund, and further, terrorist networks and groups. When I said that 2012 and 2013 Johnson sounded less like trump in track shoes than 2016 Johnson, he said that he would adopt our new language for his platform and apologized for being led astray by the same goons that did the same to the tea party. Is he my perfect candidate, no, but he has given me verbal assurances that he is through with those advisors, and will try to improve his knowledge of our community, and will use me as a direct source when questions about the American Muslim community arise. I also have his assurance that there will be a statement soon about party unity, and not attempting to disenfranchise party members who are not supportive of his ticket, and definitely to end this talk of purging purists and “radicals” from the party. If he lives up to his word, i’ll do what i can to put our activists behind him. There seems to be some confusion about my statements about Gary Johnson a few days ago. I’m not endorsing him, or his campaign. I am simply open to working with Gary at this point if the feeling is reciprocal, and results in action, rather than promises. The more he shows me he is listening, the more positively i will speak about him. At the moment I am simply reserving any further judgement to give gary and his team time to make good on their word. If they do then i am happy to further support him, if not then i’ll be a thorn in his side. 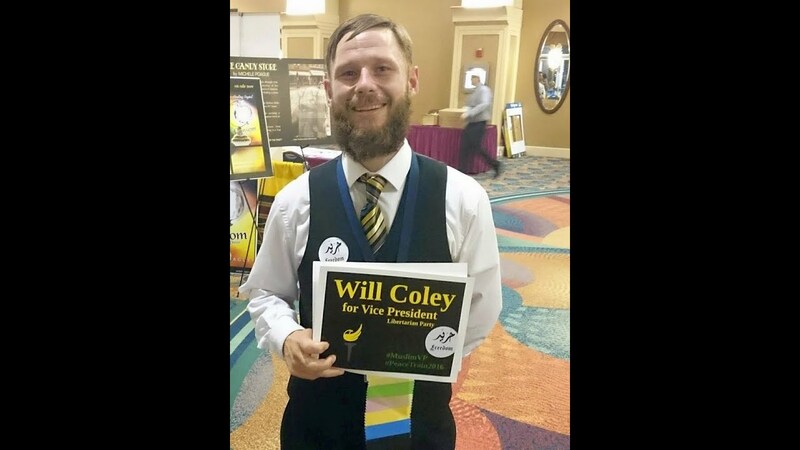 This entry was posted in Libertarian Party and tagged Gary Johnson, Libertarian Party, Will Coley on June 5, 2016 by Krzysztof Lesiak. The issues surrounding him getting the entire Muslim stuff wrong is only part of the reason I did not vote for him. So far I saw him change some of his debate lines to mimic ones that John McAfee has been consistent with. I have not seen any other change. Gary Johnson and his supporters have already disenfranchised a lot of us by putting Weld on the ticket. Purging? Is it Purge Monday again? Seriously…around every convention we hear the same “purge the radicals!” and from the other side “purge the minarchists!” and all the rest of the junk. But by then it may be too late. Does Will approve of this? His top advisor right now is Bill “I Love Hillary” Weld. Is Gary Johnson incapable of thinking for himself? Andy, neither you nor any other LP members have been “disenfranchised” since you as an LP member had the opportunity to participate in the nominating process by voting at the convention or voting to select delegates to represent you at the convention. A majority of the delegates chose Johnson and Weld. Every LP member had the chance to play their part in the process. Coley just accused the US of funding terrorism–more than Iran does. Unless the US has some hidden terrorists stashed away somewhere, the US subsidizes nothing like Iran does, with Hezbollah, that has set off thousands of rockets indiscriminately into Israel, murdering and maiming innocent civilians and damaging infrastructure. He then has the chutzpah to criticize Qatar for subsidizing terrorism; while true, Coley himself is subsidized by the Qatar government, which funds the online madrassa where he learns about political Islam. When asked if he supported the right of Israel to exist, he said no; that he doesn’t want any states to exist. Sharia law provides the principles by which political Islam organizes force to conform human behavior. Hence he favors the political aspect of Islam, by a different name. He expects libertarians to be fooled by his non-traditional terminology; yet a government by any other name is still government. Alternately, theoretically, he could actually believe that force should not be organized in defense of innocent life and rightful property. In either case, he would be off his rocker. What planet are you living on, Kevin? I live here on Earth. I find it very likely that we fund terrorists more than Iran.